efficiency, low toxicity, fast, and broad sterilization ability. Chlorine by contrast does NOT kill biofilm. the ozone layer as chlorine gas does. 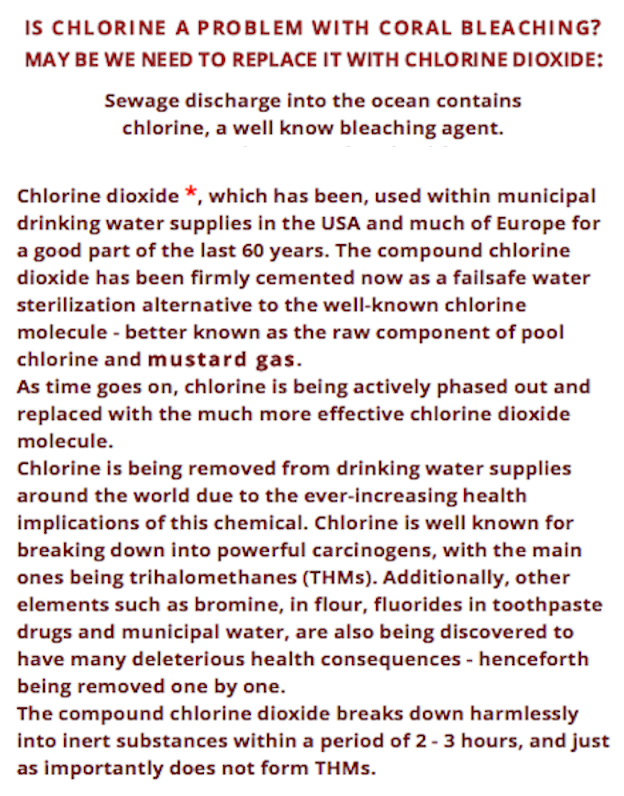 CORAL BLEACHING - CHLORINE v CHLORINE DIOXIDE. 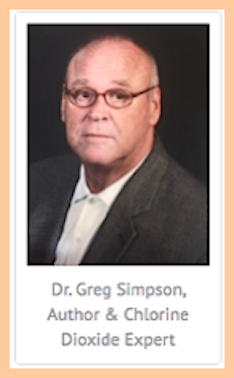 This is another great paper by Dr. Greg Simpson. Sir Humphrey Davy, a British chemist, discovers chlorine dioxide (CD), a result of potassium chlorate reacting with sulfuric acid. Although he fully understood the chemistry, he most likely did not appreciate the consequences: CD will prove to be more effective at killing more viruses, bacteria and fungi than any comparable disinfectant, such as chlorine bleach. Because of the disinfecting power of CD, use begins to grow. A major benefit of CD is that, as a true gas, it expands uniformly to fill the space it is disinfecting. Due to concerns about the logistics of safely transporting the gas, industries wishing to use it decide to simply make it themselves in large quantities and activate it on site. To mitigate taste and odor problems, CD is introduces into a water treatment plant at Niagara Falls, N.Y. Other municipalities soon do the same. The water not only tastes better and has no unpleasant odor–it’s also safer to drink, thanks to CD’s strong disinfecting properties. The Environmental Protection Agency (EPA) registers an aqueous form of CD for use as a sanitizer and disinfectant. Even though it aggressively attacks pathogens it is extremely safe and CD is eventually used to commercially sanitize fruit. 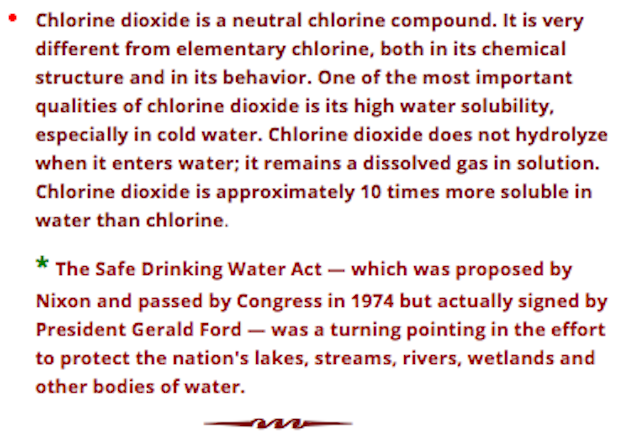 1970s to early 1980sThe EPA begins recommending using CD instead of chlorine bleach to treat water because CD does not produce any harmful byproducts. Although chlorine and chlorine dioxide share a common name, they are fundamentally different chemicals with distinctly different chemical structures. This means they react differently when mixed with other compounds. 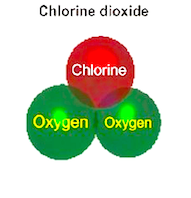 Chlorine bleach is formed by adding chlorine gas to salt water. 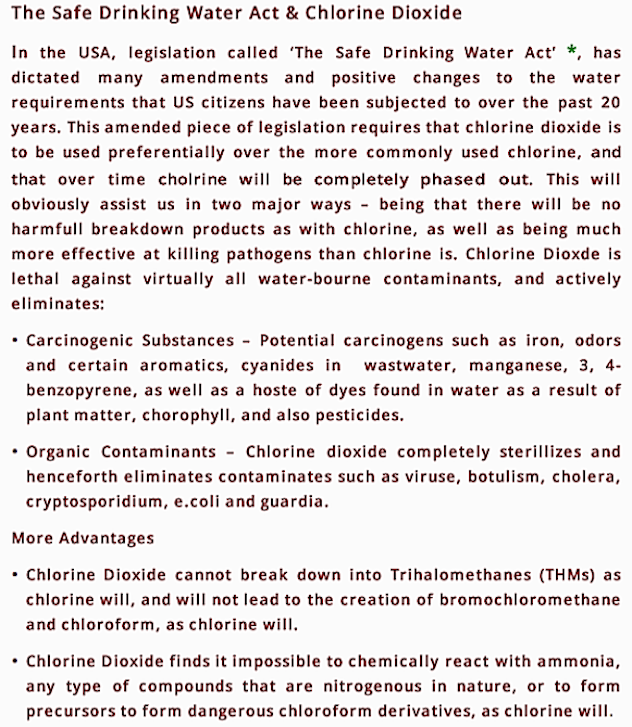 However, when chlorine bleach reacts with naturally occurring organic and inorganic matter in water streams, it produces THMs (trihalomethanes). THMs have been linked to cancer. Because of its superior efficacy and how safe is its, use of CD continues to grow. The EPA registers CD as a sterilizer. This means CD is both safe and effective to use in hospitals, healthcare facilities, and laboratories. 2001CD, in both liquid and gas forms, becomes the number one substance used to decontaminate buildings where the anthrax attacks occurred. It’s success rate is based on how well is works against very small anthrax spores, how quickly and easily it is deploy. CD completely destroys anthrax without harming buildings. (January) ProKure revolutionizes the way CD is deployed. For the first time, because of ProKure’s patented technology, CD can be created at any time, and anywhere there’s water. It can now be safely transported in dry pouches and made into a liquid disinfectant and deodorizer on site and on demand. In essence, the ProKure product line has made it possible for industries and companies of all sizes (not just a select few) to quickly and easily unleash the amazing power of chlorine dioxide. 2014 (November) CD is now two hundred years old. The Centers for Disease Control (CDC) registers ProKure V as a disinfectant against the Ebola virus. ProKure V begins to kill pathogens in a matter of seconds, whereas other commonly used, more traditional disinfectants take minutes. The rapid speed in which ProKure V kills pathogens makes it a product of choice for helping contain infectious-disease outbreaks and keeping public facilities cleaners and safer for everyone. OZONE LAYER AS CHLORINE GAS DOES. 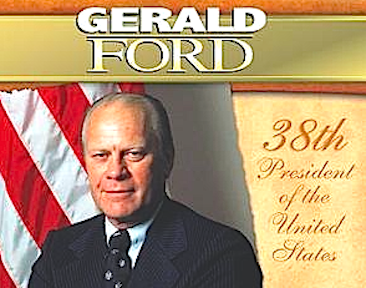 Federal law in order to promote and fund the practice. Air conditioning cooling towers, Swimming pools, Potable water treatment. 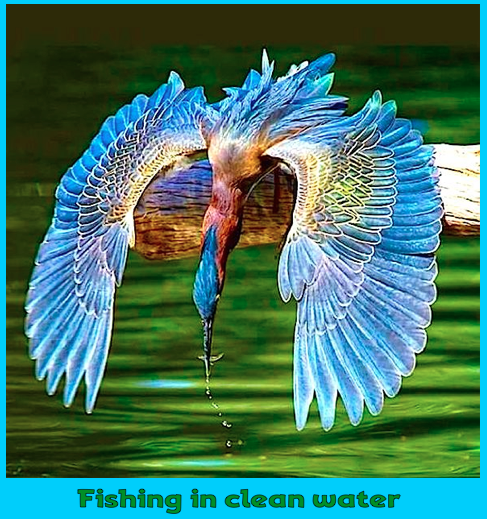 UrbanUtilities – Queensland still uses Chlorine ? is beyond the intended scope of this web site. Chung-Hsing University Taichung 402, Taiwan.